Efficiency is based on technical specifications and construction methods. 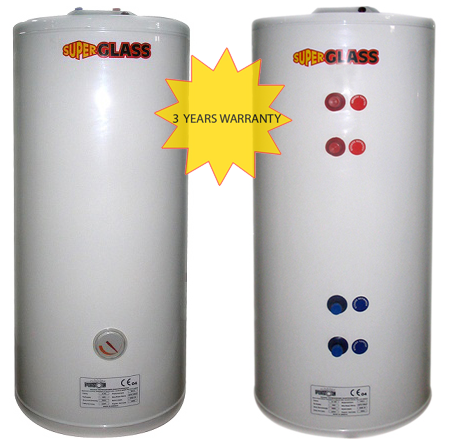 The boiler can operate connected to the central heating system AND electric power. The superiority of the PIRSOL boiler is based on its equipment, raw materials and construction process. 1. Quality, 3mm thick, carbon steel sheet able to withstand any water pressure of the main piping system. 2. Exterior Lining in accordance with the EEC standards to ensure complete erosion – corrosion protection, galvanic protection and naturally clean drinkable water. 3. Additional cathodic protection through magnesium bars that completely prevent galvanic reactions. 4. Insulation with 7cm thick polyurethane that keeps the water hot for over 48 hours. However, the PIRSOL Solar Boiler excels mostly in the fact that the water circulates in bellows and not in coils. The bellowed structure ensures not only large, but also rapidly heating surfaces.